Bizarre as some of these formations on this page were, however, it must be remembered that the elite SS Panzer and Panzer-Grenadier Divisions represented Germany’s most effective troops in the last stages of the war, setting a standard unsurpassed and seldom equalled among the forces of any other nation. 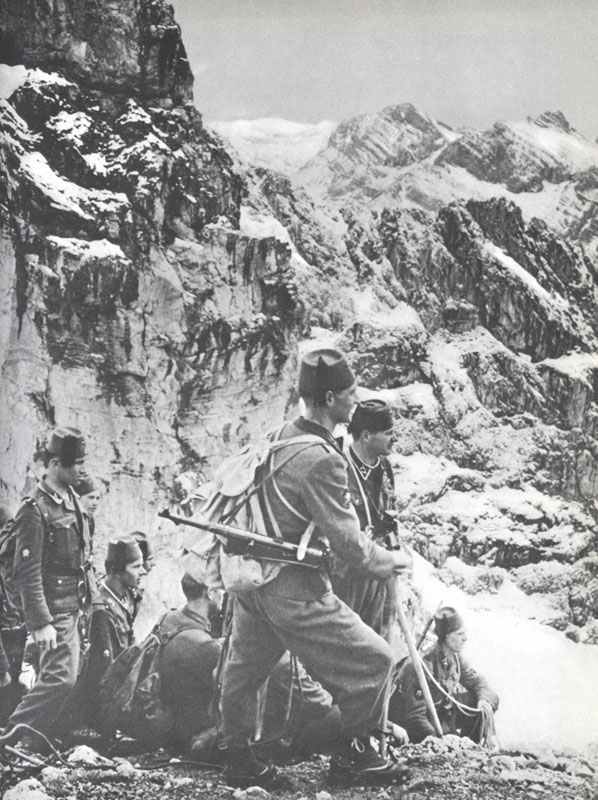 Soldiers of 13 SS division were hunting Tito partisans in the mountains of the Balkans. July 1943 (operational March 1944). Disbanded October 1944 because of much desertion in face of the approaching Red Army. Recruited among Bosnian Moslems, traditional enemies of Christian Serbs from whom majority Tito’s partisans draw. Mutinies in France during training, later many atrocities. April 1943 (operational June 1944). Surrendered to British in Steiermark, May 1945. Handed over to Russians. Some survivors from Tarnow Pocket (July 1944) fought way from Carpathian Mountains to Bavaria in winter 1946-47. 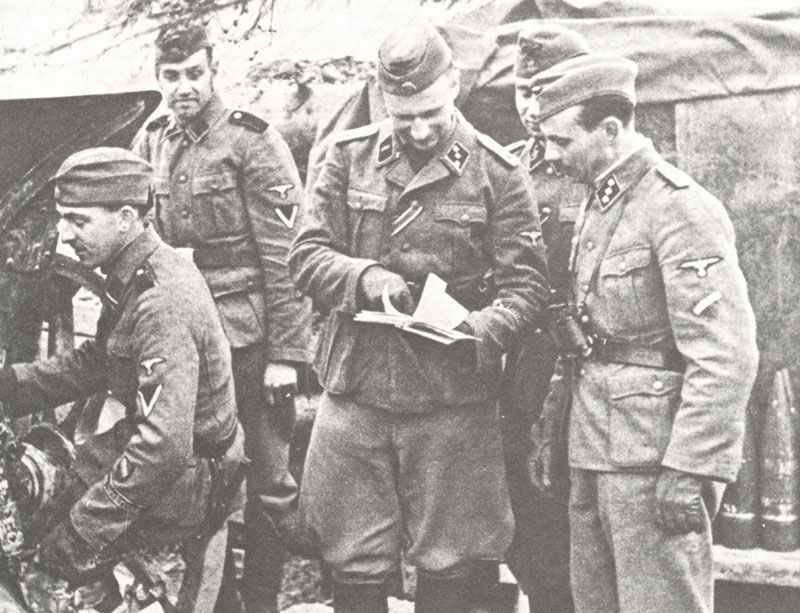 Recruited among Ukrainians (massive voluntary response) with German cadre. 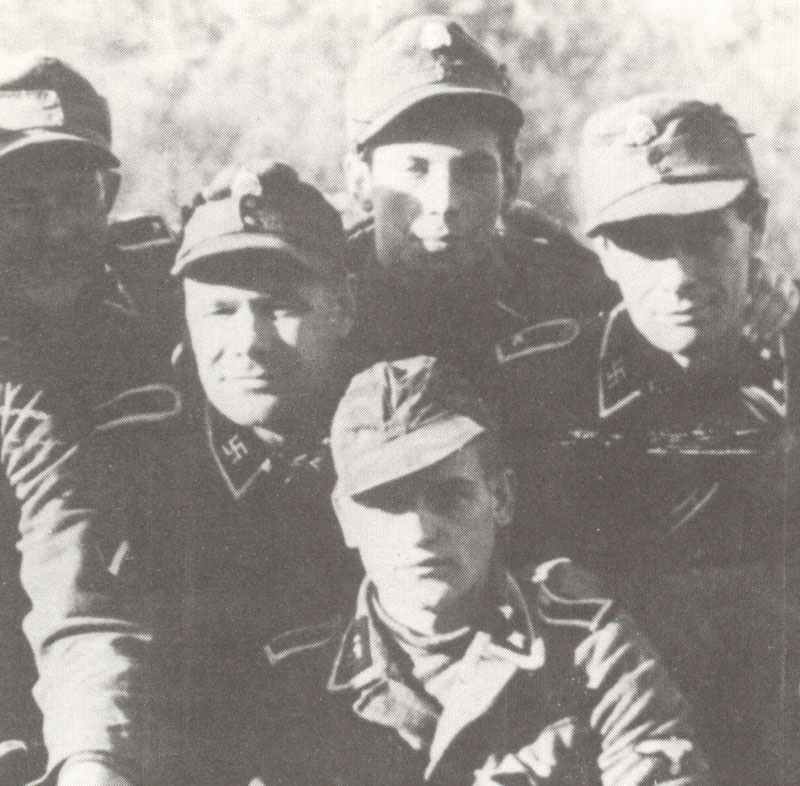 3 Dutch SS soldiers with two Latvians of 15 Waffen-SS division. Early 1944 expanded to division. Part surrendered to Red Army at Neu-Ruppin, part to US Army near Elbe. 3 infantry regiments, 1 fusilier battalion. Formed from Latvian volunteers. Best fighting record of Baltic formations. Expanded to division since October 1943 (operational February 1944). Dispersed units surrendered to British at Carinthia, Austria. 1 Panzer battalion (with 4 companies Panzer IV and Panzer V Panther, each with 22 tanks), 3 Assault gun batteries each with 10 StuG III, anti-tank coy with 10 Jagdpanzer IV, from December 1944 12 AA-tanks. Many replacements by German ‘Volksdeutsche’ (ethnic Germans) from the Backa (Hungary, Slovenia). Raised in France, November 1943. In action in Normandy in June 1944, before the establishment was complete. Surrendered to 101st US Airborne Division south of Kufstein (Austria) on 6 May, 1945. 2 motorized infantry regiments (each with 3 battalions, but less than 2/3 of the vehicles were available in June 1944). 3 tank companies ( StuG III, StuG IV and PzKpfw IV), from July 1944 1 company Hetzer . Nearly destroyed in Normandy and rebuilt with older soldiers from Kriegsmarine and Luftwaffe in November 1944. 11 month’s of continuous fightings in the West. Raised in France, January 1944. Annihilated at river Elbe between May 8-10, 1945. 2 motorized infantry regiments (each with 3 battalions, one company with APCs). 3 tank companies (each with 14 StuG III or IV), since February 1945 two anti-tank companies with Hetzer . Replacements by ‘Volksdeutsche’ (ethnic Germans) from Hungary, since 1945 young boys from Hitlerjugend (Hitler Youth) and Volkssturm (Home Guard). Surrendered to Red Army, Mitau (Kurland/Baltic provinces), May 1945. Raised from Latvian security troops and other Baltic personnel. In action on Baltic coast and Kurland pocket, 1944-45.